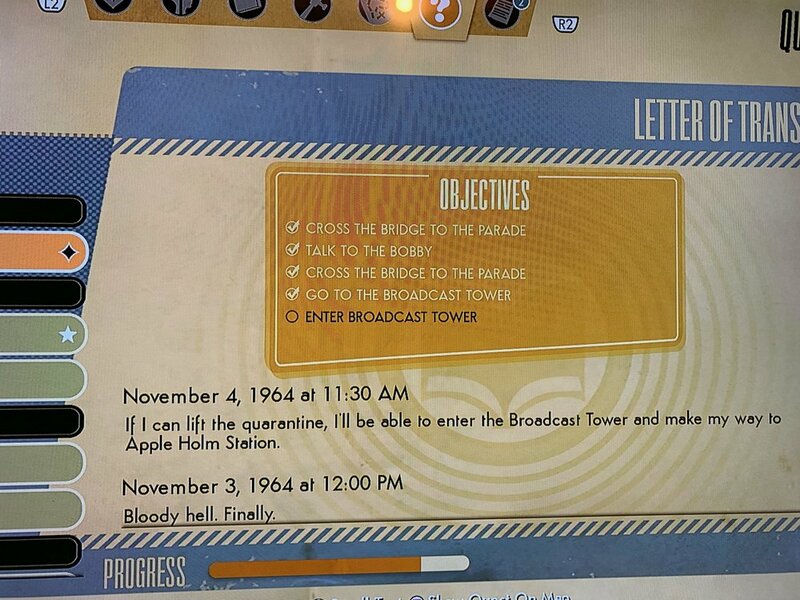 There are a few quests related to Letter of Transit in the Parade District. Are you stuck at a point inside the Wellington Health Institute, or is the issue occurring earlier than that? To help us troubleshoot the issue, could you attach a video or screenshots of what you're experiencing? Screenshots or a picture of your quest journal would also be helpful. Here’s a better visual, I’ve noticed that I didn’t get the Future perfect quest or the Malpractice of doctors as I seen other people who’ve played get those quests. Thanks for that and I apologize for the late reply. This could be a known issue where the Future Perfect quest may not trigger when exiting Hostile Takeover. We fixed the issue in v1.4, however if you're playing on an older version or the save game was created before this patch, it's possible it can still occur. If the NPCs who trigger the quest (the Doctor and the Wellette outside Hostile Takeover) are still alive in your game, then the patch should fix your save game and you should be able to trigger the quest. If not, then unfortunately you will have to load an earlier save, before exiting Hostile Takeover, or start a new game. I'm sorry to have to tell you this. In your save game, you will first want to try walking through the doors and triggering the conversation that happens at the beginning of the video. If the NPCs are still present in the world, then the conversation should trigger. If not, then I'm afraid the quest will not trigger on that save game. If you need to load an older save, there should be a save game called 'Last Shelter Visited' (second from the top in the save game list). This save would have been created the last time you entered a safe shelter.